Dibasic calcium phosphate‚ stearic acid‚ microcrystalline cellulose‚ and modified cellulose gum. diabetic or taking insulin or any other medication for glucose control‚ consult your health care professional before using this product.Do not use if either tamper-evident seal is broken or missing. Keep out of the reach of children.Store in a cool‚ dry place.Suitable for vegetarians. Gymnema Sylvestre by Source Naturals is part of the Gut Health Protocol book. It seems to be working. 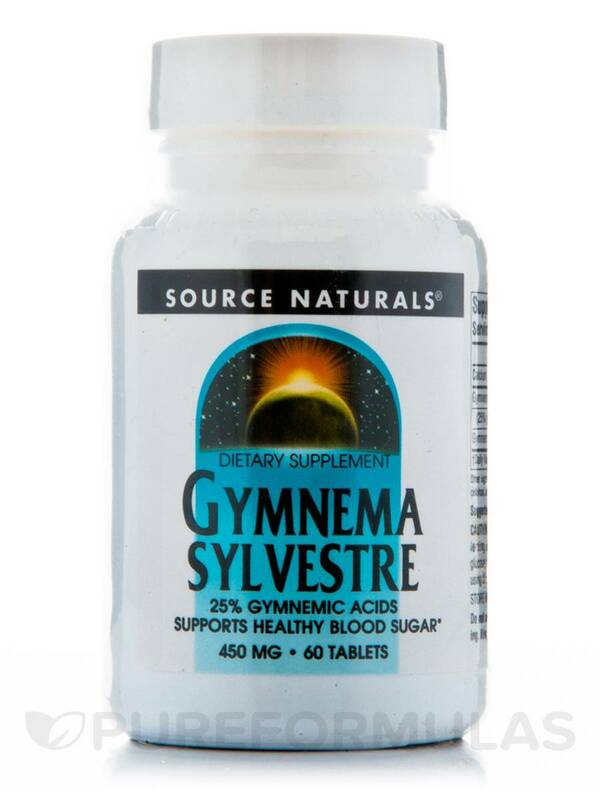 Gymnema Sylvestre by Source Naturals is a good formulation because each tablet is standardized to contain 25% gymnema acids, which is the minimum amount for which you should look. (The whole leaf doesn't do much; it's the acids you want. With this product, however, the effect on blood sugar and cravings is subtle. If you want more bang for your buck, consider the Source Naturals formulation with 75% gymnema acids. Very pleased with Source Naturals. I can't say enough about how pleased I am with this Gymnema Sylvestre by Source Naturals in general. This is an effective, affordable way to help control blood sugar naturally. 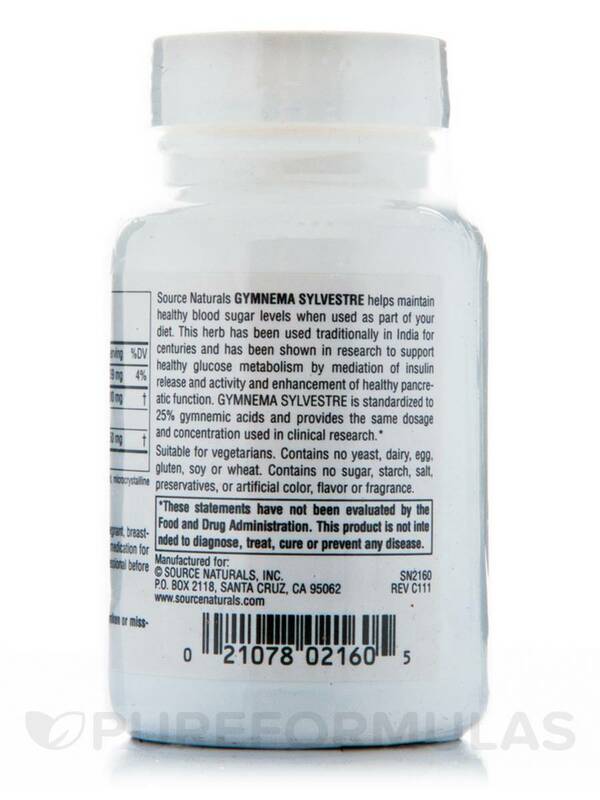 With gymnema, you want formulations that are standardized to 25% gymnemic acids at the very least. This one fits the bill! Wish it came in a capsule. Subtle effect on blood sugar. I've ordered Gymnema Sylvestre by Source Naturals twice now, and I guess I consider them to have a very subtle effect on blood sugar. 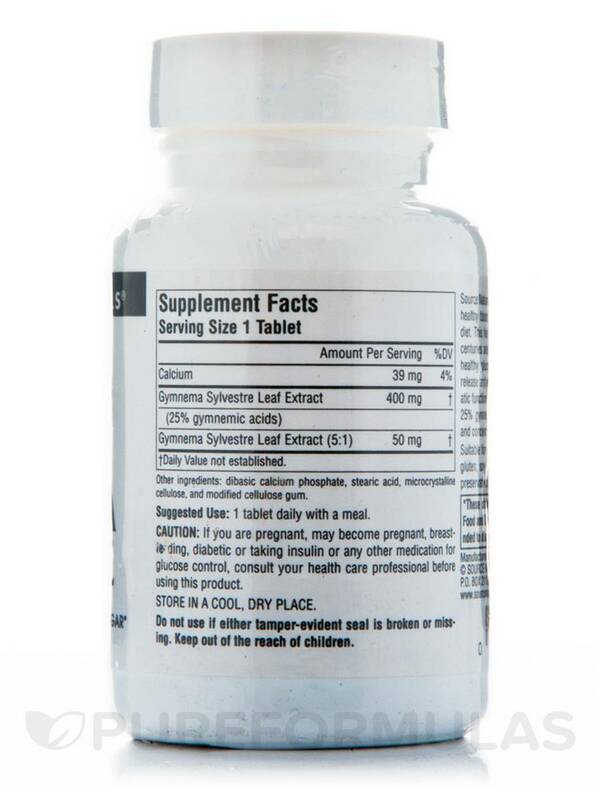 If, like me, you have a family history of diabetes, including developing gestational diabetes during pregnancy, herbal supplements like gymnema sylvestre can be a proactive way, along with diet and exercise, of staving off the full blown disease. As I understand, it, you want the kind that stipulates at least 25% gymnema acids. I am very happy with the results from Gymnema Sylvestre by Source Naturals on the symptoms of pcos. I have issues with sugar cravings and this actually helps with that. I take it two to three times a day and find the sugar highs and lows aren't as bad. Love that it has helped keep my blood sugar stable which is hard with pcos.